Cuchifritos Gallery + Project Space presented on June 10th On the subversion of opacity [About Practice#3], a two-person exhibition of recent work by Arianna Carossa and Beatrice Glow, curated by Alessandro Facente. 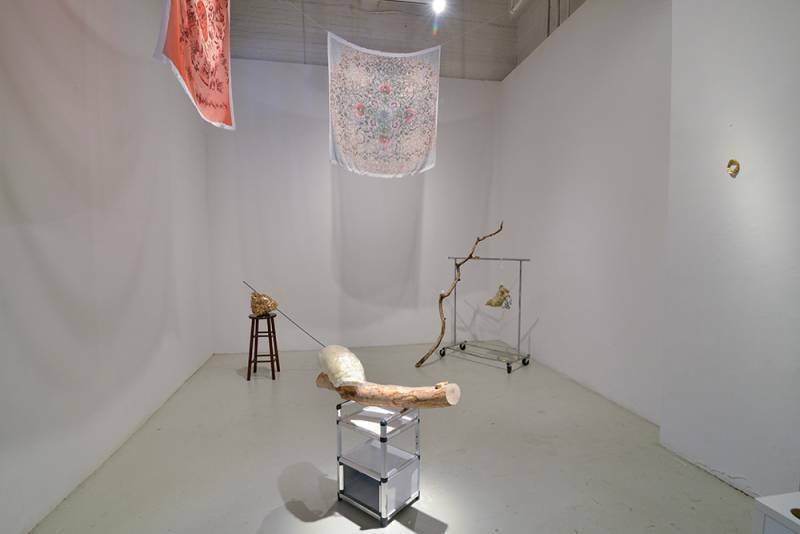 Through site-specific installations, including sculpture and digital prints on silk, this exhibition considers the ways in which artists provide an indirect view of reality, representing it as a fictional mythology drawn from its facts, forms, or histories, but never reflecting them directly. Even as a fiction, this mythology is able, perhaps even more so, to reveal the original reality at its core; an inner essence not beholden to its usual context, interpretation or common understanding. Instead, the new work behaves as autonomous form; an expanded field that is both in balance and in tension with the one from which it has been originally generated. 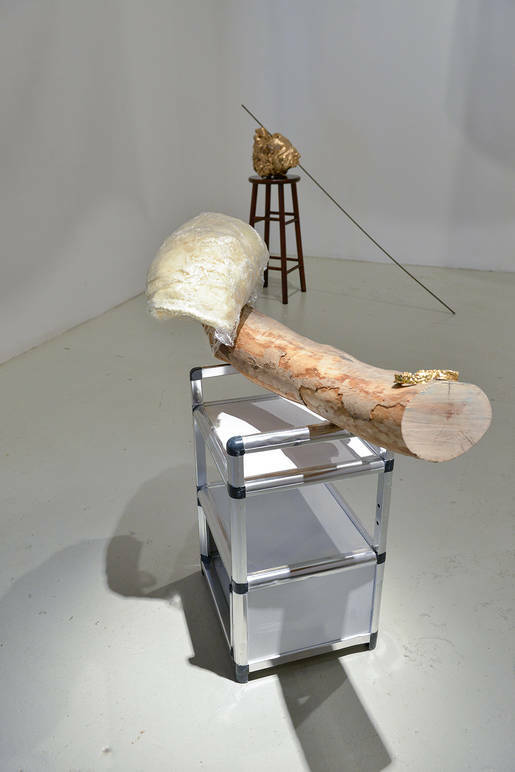 By investigating the ways in which reality can become dissociated from recognizable forms and ordinary knowledge, the exhibition considers the manual labor, or craft, within an artist’s practice and its potential to modify, shape, overturn, and radically change an existing object, shape or event (historical or current) in the process. In his 1988 essay “Lightness,” published in the compendium Six Memos for the Next Millennium, Italo Calvino likens the writer’s creative act to an indirect gaze on the world; just as Perseus defeated Medusa by following her movement in the reflection of his shield, the strength of the literary imagination is in a writer’s ability to wade through the opacity of our literal world through the transformation of fact into fiction; subverting what Calvino describes as the “petrification” or “the weight” of ideas through the lightness of mythology and its visionary language. Similarly, Arianna Carossa and Beatrice Glow’s works aim to experiment with personal formalism, creating new worlds that encourage the viewer to exceed their own assumptions within an exhibition space. Across her entire practice, from site-specific projects to sculptures to land art, Arianna Carossa strives to create work that emerges from the environment in which she is called to realize a project, aiming at searching for situations or moments where the design of an object itself can relate to everything around it. For many years, at the center of her research there has been the object: intended as raw material to be reinvented through different forms and expressions. Her process is strongly rooted in Arte Povera, but completely reinterpreted through a language which is profoundly personal and carefully aimed at investigating new materials, such as found objects, pieces of furniture, ceramics and paintings reassembled as a reflection on universal themes. On the occasion of the show, Carossa exhibits a new body of organic/animal-like-shape sculptures made by using expanded foam, colors and found objects, whose interaction in the limits of both the piece and space, offer viewers mixed feelings, based on a balance between opposite forces, including dirty and clean, hard and soft, bright and opaque, weight and light. Glow’s installation at Cuchifritos consists of a new body of work that tells the social history of spices as a bloody continuum of exploitation, extraction, and land dispossession. 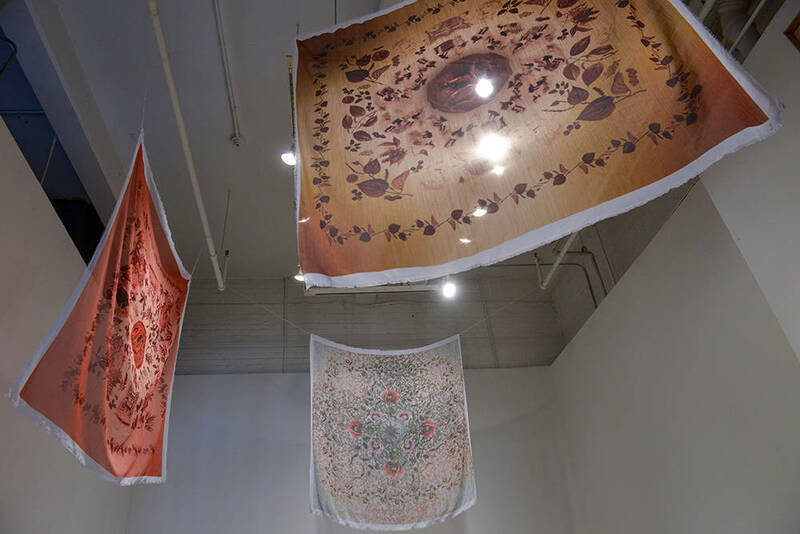 She created a series of digital prints on silk drawing upon historical depictions of the spice trade combined with her own drawings that are inspired by botanical research to illuminate the transhistoric weight of spices, silks and colors that have propelled forward countless caravans and ships in the birthing of globalization. The artist considers these silk prints as objects that sit between the resemblance of Mantones de Manila and oriental rugs, objects that embody a long history of trade, cultural circulations and mystique. The transparent and weightless quality of silk evokes the ghosts of history that invisibly shape our present while starkly contrasting historical gravity.